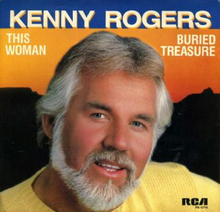 (1984) "Eyes That See in the Dark"
"Buried Treasure" is a song written by Barry, Robin & Maurice Gibb, and recorded by American country music artist Kenny Rogers. It was released as the B-side of "This Woman" in January 1984 as the third single from the album Eyes That See in the Dark. The song reached number 3 on the Billboard Hot Country Singles & Tracks chart and number 2 on the Canadian RPM Country Tracks chart. Barry Gibb's version of "Buried Treasure" was a guideline for Rogers' album Eyes That See in the Dark released in 1983, this version was not released until 2006. This song is a country singalong along the lines of the songs Barry and Maurice had done before, and Maurice appears to be singing the harmony done by The Gatlin Brothers on the completed recording. Gibb's version was recorded around February along with four songs also intended for Rogers' album "Hold Me", "Living with You" and "Islands in the Stream". ^ Whitburn, Joel. The Billboard Book Of Top 40 Country Hits: 1944-2006, Second edition. Record Research. p. 299. ^ Brennan, Joseph. "Gibb Songs: 1983". Retrieved 14 February 2013. This page was last edited on 26 November 2018, at 19:33 (UTC).